FORT LAUDERDALE/DAVIE, Fla. – The College Swimming and Diving Coaches Association of America (CSCAA) has named 710 teams to its Scholar All-America list for the Spring 2018 Semester. The teams represent 476 institutions from across all NCAA, NAIA and NJCAA Divisions. The CSCAA recognizes teams with the Scholar All-America Award for achieving a team GPA of 3.0 or higher. In conjunction with the Scholar All-American team announcement, the CSCAA has selected a record 1,069 swimmers and divers for its Scholar All-America team. The award recognizes students that have achieved a grade point average of 3.50 or higher and competed at their respective NCAA/NAIA/NJCAA Swimming and Diving Championships. In addition to the 1,069 first-team selections, 1,137 students were named as Honorable Mentioned selections. These students have similarly achieved a GPA of 3.50 and achieved a “B” time standard or competed at an NCAA Regional or Zone Diving qualifier. In total, 289 teams placed at least one individual on the First or Second teams. As a team, the women finished with an overall GPA of 3.30, while the men posted a 3.12, the fourth consecutive semester above a 3.0 GPA for both teams under head coach Ben Hewitt‘s tutelage. 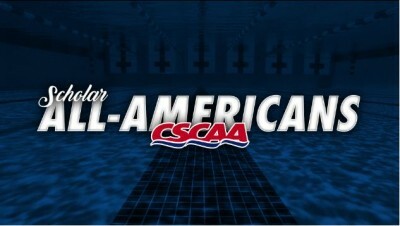 A total of 15 NSU swimmers earned the CSCAA Scholar All-America distinction. From the men’s team, two were named to the First Team and five were selected as Honorable Mentions. On the women’s side, three earned First Team honors and five earned Honorable Mention honors.